GULU – The trial of the former Lord’s Resistance Army(LRA) combatant and rebel Commander Thomas Kwoyelo in the International Criminal Division (ICD) of the High Court started on Monday 24 at the Northern regional headquarters in Gulu. 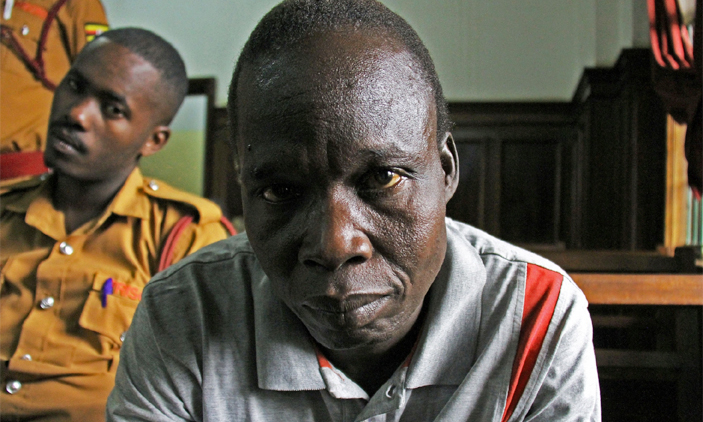 Kwoyelo was charged in the ICD of the High Court with 93 counts of crimes including murder, hostage-taking, and kidnap with intent to murder among others that he is alleged to have committed while serving in the LRA. Justice Duncan Gaswaga, Justice Jane Kiggundu, and Justice Michael Elubu will preside over the two-day court session. The session started with a parade, conference, and a closed door stakeholder’s meeting at the High Court premises in Gulu town. Hundreds of relatives, spectators and the lawyers filled the courtroom and waited for hours before the session began at 2:30 pm. Later Justice Gaswaga told the court that the session had started late because there was no interpreter. It is nearly 10 years since Kwoyelo was remanded without trial after he was captured by the Uganda Peoples Defence Forces (UPDF) from the Democratic Republic of Congo DRC in 2009. His defence team led by Counsel Dalton Opwonya includes Boris Anyuru, Caleb Alaka, and Evans Ochieng. Kwoyelo’s lawyers requested the judge to halt the trial because their client was not ready to take any plea since he was not served and was therefore not acquainted with the court documents. Counsel Jane Amooti Magdalene and Counsel Henry Komakech Kilama who represented the victims insisted that the trial continues because there was no genuine reason to adjourn. The High Court Resident State Attorney agreed to adjourn the session so that the defence team is served with all documents of the trial. Thomas Kwoyelo hails from Pabbo in Amuru district and he was allegedly abducted by LRA rebels in 1987 while on his way to school and he later became a colonel in the ranks of the LRA rebels.